"Biography and autobiography, popular science and travel writing, the history of beekeeping and the natural history of bees... Whynott excites our wonder." "Whynott portrays these 'true sons of the whalers of old' with sympathy and understanding in a book filled with depth and drama." "Whynott's attention transcends his ostensible subject until it becomes a profound look at the human condition." "Probably the best introduction to veterinary life since James Herriot." For three years I followed the maple syrup industry and one of its most successful producers and entrepreneurs, Bruce Bascom. I happened to follow Bruce during a defining period in his career, and I followed the industry during what may have been its most dramatic year--2012, the year of the Great Canadian Syrup Heist and the warmest year in history. The result is The Sugar Season, published by Da Capo Press and Perseus Books. 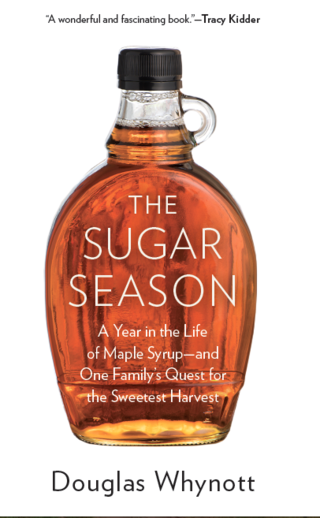 The Sugar Season won the Green Book Festival Award for writing about the environment and was selected as one of the best books of 2014 by the The Boston Globe. I have taught writing and literature at the University of Massachusetts at Amherst, Mount Holyoke College, Columbia University, and presently at Emerson College in Boston. In 2013 on a fellowship from the Fulbright Foundation I taught literary journalism and nonfiction writing in the U.S. Studies Center at Universidad Nacional in Bogota, Colombia. I am one of those writers who had some oddball jobs. I worked as a dolphin trainer and fish curator at Sealand of Cape Cod. I worked as a piano tuner at the Fine Arts Center at the University of Massachusetts. I worked as a blues pianist and studied piano with Sammy Price, king of boogie-woogie, at his piano in Harlem, occasionally performing with him at his gigs, including one at the Blue Note. During a summer in college I was a bee inspector for the state of Massachusetts, which led me to the commercial migratory beekeeper Andy Card, and to my first book, Following the Bloom—Across America with the Migratory Beekeepers. I wanted to write a book about Cape Cod, where I grew up, and about the fisheries and fishermen there. I met Bob Sampson, which led to Giant Bluefin, a book about the bluefin tuna fishery in New England, published by Farrar, Straus & Giroux in 1995. Giant Bluefin prompted an editor to write a letter suggesting I look into wooden boatbuilding in New England, which led me to a boatyard in Maine owned by Joel White, a renowned boat designer and the son of E. B. White, and to A Unit of Water, A Unit of Time. When I moved to New Hampshire and lived near a dairy farm I became fascinated with the work of the veterinarian Chuck Shaw, who ran a mixed practice treating family pets and dairy cows. That led to A Country Practice. I have written for The New York Times Book Review, the Boston Globe, Outside, Smithsonian, Reader’s Digest, Omni, New England Monthly, the Massachusetts Review, Discover, and Writer’s Chronicle.